Malo is ultra small css library for building web sites. It is meant to be structural base for small or medium web sites. 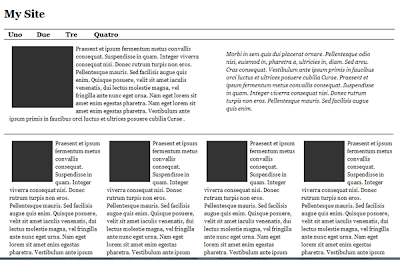 Malo is build of simple CSS reset and the grid system. You can personalize everything else. Malo works on the principle that every column can be divided into two, three, four and five parts. It also supports nested columns meaning divided columns can be divided again and again forming complex grid. First you should the naming system of Malo we have only .dp (div percent) and .clear class. Meaning dp20 is div 20%. And the structure is ready! Malo is tested almost in every browser. In IE you have around minus 1px for only column. IE doesn’t handle percentage calculation very well without this fix there is a possibility that the grid won't work correctly. This was one creative year! I started with Hartija CSS Fraemwork for web printing.One client ask me to improve the printing layout for his site. I gathered all experience from the project I did some additional research of all best practises for usability, readability and web printing with CSS. And the result was Hartija universal CSS for web printing. I always had hard times with web forms, rebuilding the same CSS code over and over. Why not this time build it once and use it in all web forms? Formy - CSS Framework for building web forms. Than I couldn't stop here I needed new challenge. To build CSS Grid Framework who will resolve all the problems of the current CSS Frameworks( Blueprint, 960 and YUI). The framework who will have minimum size, who will be fluid and em based (elastic). And the result is Emastic giving optional main width, fluid columns, less then 4kb size, baseline typography, totally em based(elastic) structure, possibility of nested DIVs etc. In the second and third version of Emastic in the plugins I added percent grid system and absolute grid system (based on absolute, relative positioning). Building one complete framework who will handle almost all CSS structural problems. Then I stooped asking myself when you need so complex CSS Framework, probably if you building some newspaper site or site with very complex grid. But I presume you don't build newspaper site every day. I took percentage-grid.css from Emastic I did some CSS refactoring and I build Malo super small and simple CSS Library(Framework). One other PHP project completely deluded my expectations: MySql Lite Administrator, I worked very long and hard on this project but I didn't receive much PHP community love. Maybe there is already so much PHP code out there, but is always hard when your free project doesn't get much feedback. Emastic,Formy and Malo out of beta. Also on one PHP Framework. I wish you lot of love and understanding at 2009 !